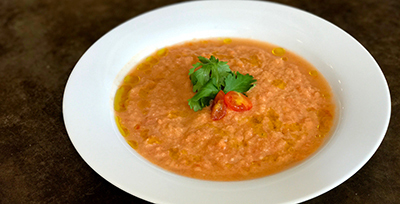 The end of the summer is tomato season throughout most of the United States, and there is no dish that tastes more like summer than gazpacho. This recipe, which, in the traditional Anadalucian style contains bread, is hearty enough for a light summer meal. The dry fruitiness of the Tablas Creek Rosé make it a perfect wine to pair with gazpacho. Soak bread for 30 minutes in a small bowl in water to cover. Squeeze out moisture with your hands. Puree bread, cucumbers, tomatoes, garlic, vinegar, olive oil, and water with an immersion blender until very smooth. The soup should be fairly thin. Chill gazpacho in refrigerator for at least two hours. Adjust seasonings and serve in individual glasses or soup bowls.